The former Spruce Apartments, under reconstruction, as they looked about this time last year. When the remodeling of the former Spruce Apartments at 222 First Ave. S.E. is finished, they will be named the Opera House Apartments, and a plaque on the building will tell the story of this site in Albany history. That’s according to the application for city approval of a site plan for the project along with a conditional use permit for seven parking spaces on the site of former gas station next door. The Albany Hearings Board approved the request on Jan. 17. A reader asked the other day what was going on at that address. So let’s catch up. Scott Lepman, doing business as Glorietta Bay LLC, bought the building in 2015. The Lepman company is remodeling and renovating the place. It used to have 19 apartments on its two floors and in the basement. When they’re done it will have 18. According to the application for the project, famed Albany architect Charles Burggraf and his partner, I.R. Shultz, built Albany’s second opera house at that address in 1905. The first one, at First and Ferry, had burned down in 1897. Opera may not have been a hit in Albany a century ago. The operation closed in 1916, and the building remained vacant until it was torn down in 1921 to make way for an apartment house constructed with most of the materials from the original structure. It housed eight one-bedroom apartments on both floors. The basement was left unfinished. In 1943, in answer to the housing shortage during the war, one apartment on each floor was turned into two studio units. Nine more studio apartments were installed in the basement, along with two common bathrooms with showers, one each for men and women. 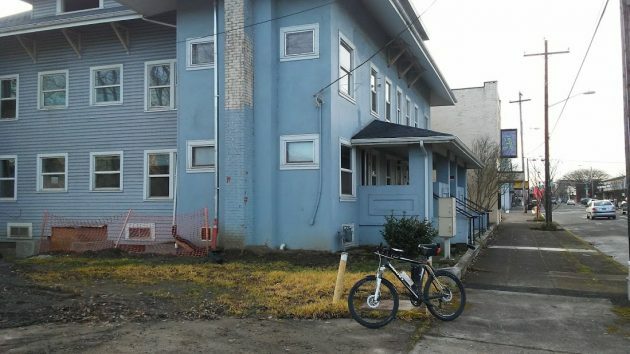 When the current remodeling is done, there will be 18 apartments and nine off-street parking spaces, along with secure and covered parking for a dozen bicycles. (The site is in part of the downtown area where no off-street car parking is required.) Seven of the car spaces will be on the adjoining lot, 236 First, were a gas station burned down in 1998 and was demolished the following year. I think this is wounderful. This building was my great grandparents Alice and Elebert Munsey, called the Munsey Apartments. My mother Alice grew up there till her marriage. My great grandpa always had flowers out front, a fish pond, and a huge hydrangea. The paucity of comments seems to indicate the scarcity of CARA dollars involved. I think the original Albany Opera House was at 2nd and Ferry where NO DELAY is.